Every summer the Pikes rent a house right on the ocean in Sea City, New Jersey. And they bring two sitters along to take care of the Pike kids. 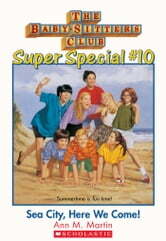 Only this time, the whole entire Baby-sitters Club is going! Mary Anne shows Logan all the sites - the beach, the boardwalk, the infamous Tunnel of Luv. Mallory gets asked out on a date (except it's with Stacey's ex-boyfriend!). And Jessi's busy being Sea City's Super Sitter. In fact, the Baby-sitters are having so much fun, no one's noticed that a gigantic hurricane named Bill is headed straight for Sea City! I love the hurricane part. its creepy and o love all the books about sea city. whoosh! The BSC is going to sea city!its fun in the sun for weeks. But a hurrican happens down there! will the BSC club survive?read this book to find out.